During the 1912/13 season Margate used six different goalkeepers in six consecutive games from 22.3.13 to 17.4.13 inclusive - Huckstep, Knowles, Worthington, Hill, Peters and Cavell were the six custodians concerned. The run was then extended to seven different keepers in eight matches when Barnes took over from Cavell for the Margate & District Charity Cup Final on 26.4.13. Cavell played for Margate's opponents Deal Cinque Ports that day. Remarkably this record was equalled during the 2009/10 season when Paul Nicholls, Luke Kiteley, Lloyd Anderson, David Blackmore, Jake Whincup and Matt Reed played in six consecutive games from 22.9.09 to 7.11.09 inclusive. During the 1920's Margate went almost eight years without winning an FA Cup game. After winning 2-0 at Sittingbourne in a Preliminary Round tie on 24.9.21 Margate didn't win again until beating Cray 2-0, also in a Preliminary Round tie, on 21.9.29. 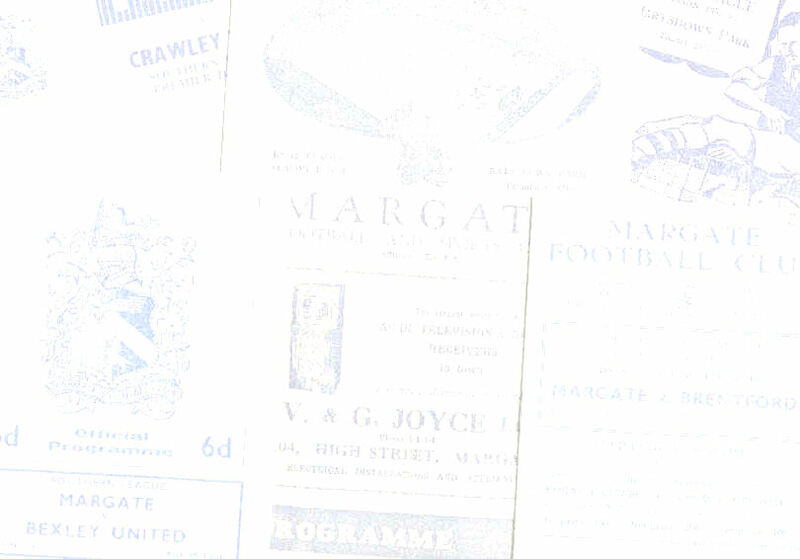 But this record was eclipsed when there was a gap of getting on for 12 years between Margate beating Crystal Palace 3-1 in a Second Round tie on 14.12.35 and the club's next victory in the Cup - a 3-0 Preliminary Round win over Chatham at Hartsdown on 20.9.47. During a 3-1 win at Royal Marines Chatham on 13.11.26 three Margate players left the field due to the effects of the extremely cold weather. They were Albert Lusted, Arthur Stennings and John Whibley. Whibley actually passed out and three of the Royal Marines side also left the pitch. The match was watched by only around 50 spectators. On 15.11.30 5,788 spectators saw Margate lose 3-2 at Tunbridge Wells' Down Farm ground in an FA Cup tie. It was the highest recorded crowd ever to have watched a football match in Tunbridge Wells. During the 1932/33 season Margate Town fielded Scottish international Alex Jackson and Welsh international Billy Mays together in seven matches from February to April 1933. On 31.10.64 Arthur Blackley and Laurie Thomson made history for Margate when they were both sent off in a 2-2 draw with Tonbridge at Hartsdown Park. It was the first time two players had been dismissed in the same match for Margate. On 31.08.66 Laurie Thomson became the first substitute ever used by Margate when he came on in a 2-1 win at Hastings in the Southern League Cup. On 11.10.67 John Fahy scored inside the first ten seconds of a 4-0 win over Canterbury at Hartsdown Park. It was Fahy's debut and he went on to score a hat-trick in the match. Winger Dennis Park is probably the youngest player ever to play for Margate's first team - he was 15 years, five months and 28 days old when he made his debut in a Kent Senior Cup tie at Ashford on 24.1.68. Another player to have played for the first team before his 16th birthday was defender Dave Carr who was 15 years, nine months and 16 days old when he made his debut on 15.11.72. His next appearance for the club (as Thanet United) came almost 15 years later on 22.8.87. On 1.4.68 John Fahy scored a hat-trick in the space of 150 seconds during a 5-0 win over Tonbridge at Hartsdown Park. On 10.8.68 Margate drew 2-2 with Weymouth in a Southern League game at Hartsdown Park and the attendance was 2,222 whilst scorers David Jarman and Bob Moffat were both aged 22 at the time. On 19.8.68 Gordon Burden became the first Margate substitute ever to score when he struck twice after coming on in a 4-0 win over Dartford in a Southern League Cup tie at Hartsdown Park. On 6.2.71 Frank Peterson became the first black player to play for Margate. On 16.8.72 Norman Fusco became the first Margate player to score a goal when making their debut as a substitute. When Tottenham visited Margate for the famous FA Cup 3rd Round tie on 13.1.73 it was the first time that Spurs had played an FA Cup tie on the ground of a club outside of the Football League since the First World War. On 19.1.74 Colin Clewlow scored a hat-trick after coming on as a substitute during an 8-0 win over Tunbridge Wells. Darren Watson achieved the same feat in a 3-3 draw at Morecambe on 1.11.03. The first time Margate ever used more than one substitute in a competitive game was on 6.8.77 when Alan Draper and Greg Wood both came on in a 1-0 win over Ramsgate in the Kent Senior Shield. When he played for Margate in an FA Trophy tie at Hastings on 1.12.79 goalkeeper Phil Brooman was making his first appearance for the club since 4.1.64 - a gap of almost 16 years. On 24.8.82 midfielder Steve Waghorn made his debut in a Southern League Cup tie at Crawley and had to play in goal. On 22.10.88 four Thanet United players were sent off in an FA Trophy tie against Leatherhead at Hartsdown Park. The players dismissed were Gary Collins, player-manager Norman Fusco, John Lineham and John Munday. Leatherhead won 3-0 and it was Fusco's 494th and final appearance for Margate / Thanet. On 28.8.00 Mark Munday scored a hat-trick of penalties as Margate beat Fisher Athletic 5-0 at Hartsdown Park. During the 2000/01 season John Keister became the first Margate player to win a full international cap whilst playing for the club. On 8.12.01 Nick Roddis became the first Margate player to be sent off on his debut for the club. On 20.3.02 Leon Braithwaite and Nick Roddis became the first Margate players ever to play for the England semi-professional team whilst with the club when they both featured in a 2-1 win over the USA. When he played for Margate at the start of the 2002/03 season Charlie MacDonald became the first player with English Premier League experience to play for Margate. During the 2005/06 season Margate drew eight consecutive Isthmian League games from 27.8.05 through to 4.10.05. By the end of the 2013/14 season four players had taken more than 100 games to score their first goal for Margate - Terry Joyce (scored on his 138th appearance), Wayne Godden (134th), Phil Handford (106th) and Bill Parry (103rd).